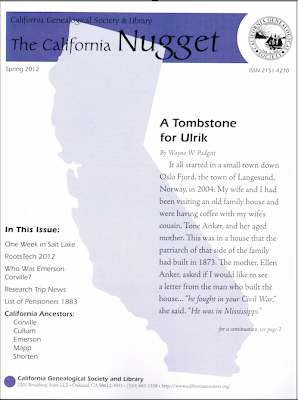 The Spring 2012 edition of The California Nugget has been sent to the printer and will soon begin arriving in members' mailboxes. Editor Jane Hufft and Production Editor Lois Elling have outdone themselves with another fantastic issue filled with interesting articles. We have a variety of articles for you, each one an exciting account of significant discoveries. Wayne W. Padgett found a forgotten Civil War soldier in a very unlikely place and uncovered the details of his battle experiences. What started out as a quest to answer a few questions concluded with a moving ceremony involving two countries. Linda Okazaki was on the same trip and she will agree the stars were aligned! The startling discovery of an ancestor’s true name in a San Francisco newspaper account sent Linda’s research in completely new directions, solved a long-standing mystery and provided an astonishing story for descendants. Without Amy Coffin, many of us would not be aware of what is happening on the frontiers of genealogy. Her insider view of the 2012 RootsTech conference gives an update on the future of family research, and it most certainly involves technology. CGS President Jeffrey Vaillant tells all in his account of the society’s August 2011 research trip to the Allen County Public Library in Fort Wayne, Indiana. Participants met Library Manager Curt Witcher, found genealogical treasures in the stacks and microfilm collection, and sampled Fort Wayne restaurants and Indiana weather. Write your stories and send them to us. We’d love to hear about your research, your discoveries, and your aha! moments with technology. There is space reserved in The California Nugget for your family, and, please note, you do not have to be a CGS member to submit a manuscript. Having your family history in print in a journal that is archived in libraries across the United States guarantees permanency for your research. Email me at jhufft@comcast.net for the Submission Guidelines and then take the leap. Make 2012 the year you visit a new library, learn the latest technology skills, and write it all down! 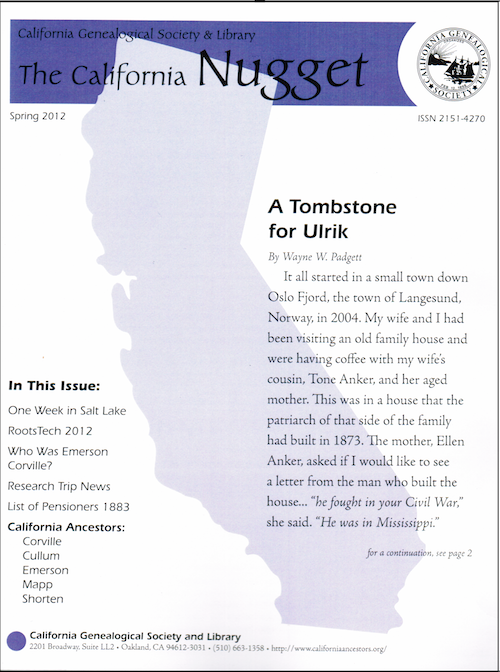 The California Nugget, the magazine of the California Genealogical Society, is published twice a year. Its purpose is to share the unique genealogical material in the CGS library, add to the body of family history information about Californians, offer guidance and timely information to family researchers, and to provide a forum for members to share their expertise and findings. Opinions expressed are not necessarily those of the society. The magazine is distributed free to members and is available to non-members for $5.00 an issue, plus postage.